“Page, a new eatery developed with The District’s own Chef Carla Hall opened at Ronald Reagan Washington National Airport’s Terminal A. Hall, best known for her vibrant personality on Bravo’s ‘Top Chef’ and ABC’s ‘The Chew,’ partnered with airport hospitality group OTG to bring local flair and fare to the comfort food menu. The 110-seat restaurant serves up an assortment of locally inspired favorites, including a Pimento Cheese Dip, Cured Ham and Biscuits, Virginia She Crab Soup, Chesapeake Oysters, Vegetarian Quinoa Burger, Lobster Roll and BBQ Cobb Salad. Conveniently located in the center of the boarding gates, travelers can pull up to this new outpost, charge up their devices thanks to outlets at each seat, and order food from a visual menu off an iPad. The iPads also enable travelers to check the status of their flight, complimentary browse the web, or enjoy a number of pre-loaded apps. The 75-plus tablets situated throughout the restaurant seamlessly integrate into the guest experience, operating off of OTG’s award-winning software platform floTM. 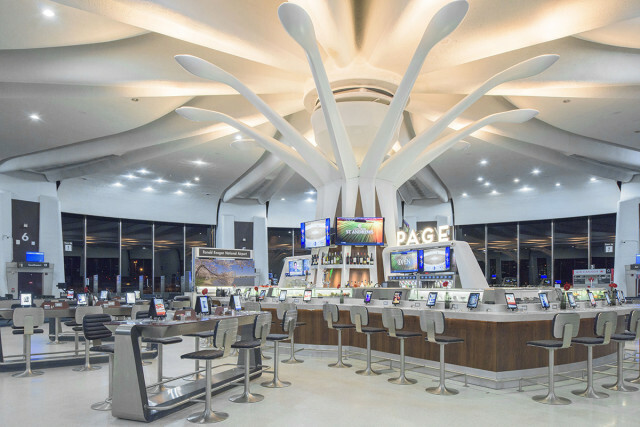 The design of Page brings a bold and modern update to the iconic terminal, while preserving its historic and unique architecture. OTG’s partners in this venture Pleasant News and Baldi Management Group (BMG) will soon add to the eclectic dining options in Terminal A. Pleasant News will operate Custom Burger, Tagliare and Boars Head Deli and Baldi Management will operate Dunkin Donuts.